To celebrate National Bed Month, we’re taking a look at some of our popular upholstered bed frames, and ones to watch out for in 2018, all hand crafted in our Nottinghamshire factories. Why are our bed frames so good? 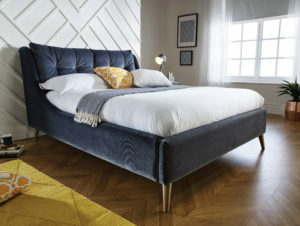 Using the same innovative approach, skill and craftsmanship we put into our sofas, Whitemeadow are proud to offer an extensive selection of upholstered bed frames that your customers are guaranteed to fall in love with. 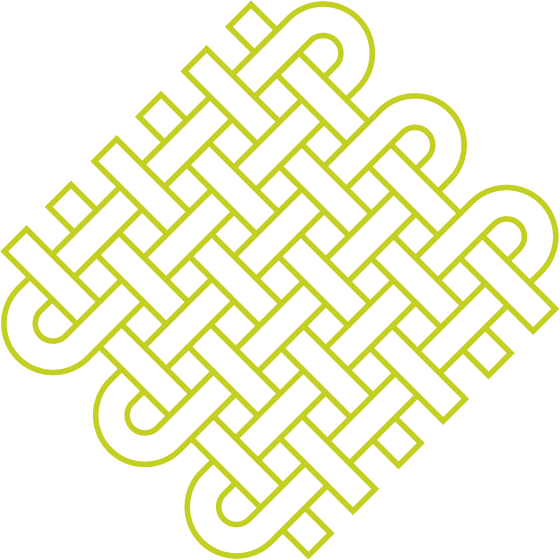 Knowing that the finer detail is in the finishing touch to any product design, whether it be a particular style of stitching, buttoning, piping or feet, we have the skill and expertise to apply finishing flourishes. We aren’t limited to a particular style of handwriting either when it comes to product design, we’re determined to push the boundaries. So rather than producing a singular structured house style, we offer design styles appealing to a wide spectrum of customers, from pure contemporary, through to modern and traditional. We also understand how important great fabric is, so we only source fabrics from the finest mills in the world, and that pass our rigorous testing procedures. The epitome of sophistication, Kensington is a grand, opulent design featuring a winged frame, which creates a strong presence in any bedroom. Available in a choice of colours, it is perfect for either a glamourous, modern classic interior or country chic style. Kingsbury features the distinctive curved profiles to its side rails and head & footboards, typically associated with the Sleigh Bed style found throughout history. Refined and timeless, the design is unashamedly opulent whilst retaining a Grande stately presence. The headboard & footboard features Whitemeadow’s trademark deep buttoning detail. Launched in summer last year, these models are now on shop floors and performing very well across a selection of retailers. Distinctive in nature, the Brixton bed frame is designed to project a super luxe, contemporary look which demands attention. Effectively demonstrating the workmanship and detail we have become known for, the deep buttoning detail creates a super soft, luxurious and inviting look. Another new model to watch out for is the Ralph. An outstanding model which combines the very best of individuality in design and style, whilst still offering superior comfort. 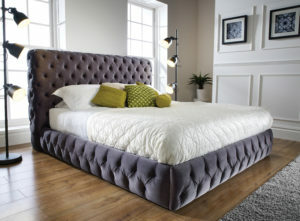 Features include a graceful curved wing profile and deep buttoned single width headboard pillow. The headboard features a removable pillow designed for sitting up in bed and relaxing. For the first time in our history, we were proud to have a dedicated bed stand at the January Furniture Show, where we launched a selection of brand new models for Spring/Summer ’18. Among those was the Ellen bed frame. Inspired by French provisional design, Ellen is a modern update based on the classically elegant proportions and shape of this style of design, and was presented in Lumino Turquoise, a new fabric for 2018. The frame has been finished to offer a softer padded feel, combined with a cleaner look for a fresh feel based on a classic personality, something which is bang on trend with consumers. A stunningly clean style, Loretta’s single most distinctive feature is its deep ledge frame finished with crisp mitre detailing where the side rails link to the front rails. This contemporary style is again carried through with the use of sleek metal legs. Loretta was presented in a super soft velvet that has a digitally printed marble effect pattern running throughout the fabric. Through the use of panelled stitch detailing to the headboard, this creates the impression of a leather look, however with all the warmth and softness of leather. 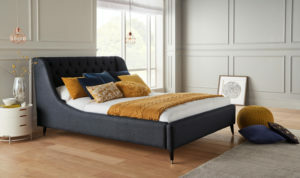 Louis is another all new model which combines elegant modern lines with sumptuous detailing and deep buttoning to the headboard. This design blends the very best of contemporary trends with grown up glamour. Presented in a new colourway of Navy, as part of our highly successful Shetland fabric range, combined with brass tipped turned legs, the model looks stunning and glamorous. For further details on all of the above and the rest of our range, please contact your dedicated Sales Manager.